It’s the end of the US, but do they feel fine? At precisely this time in 12 hours, the US has its 45th president. Good luck. In just a single day, Trump went on a rant against America’s closest allies, calling NATO obsolete, praising the UK for leaving the European Union, and expressing uncertainty that he will get along with German chancellor Angela Merkel. Two days later, he said the American dollar was too high. Sure enough [for example], the Canadian dollar rose a cent against the US dollar. Four in ten say Trump is qualified to server according to another poll. In the U.S. capital, the incoming president received four per cent of the vote — the worst result for any major party nominee in the district, ever. With Trump in charge soon, some Americans were so happy that ObamaCare will be pulled. They then say that they are happy “the Patient Protection and Affordable Care Act” won’t be touched. They like it. It’s the same thing. Trump was tweeting whether or not outgoing CIA chief John Brennan was the “the leaker of fake news”. Trump likes to start fights and this one isn’t even from Twitter. Fashion designer Tom Ford has said he declined to dress Melania Trump years ago, saying “she’s not necessarily my image.” Seems The Donald remembers petty things like these. So he had his buddy, hotel owner Steve Wynn to pull selling Tom Ford cosmetics and sunglasses. Trump said Wynn thought what Ford said was terrible. So why now? Trump told Fox his wife never asked Ford to dress her as first lady and “doesn’t like” Ford or his designs. The Secret Service says a vehicle in a motorcade for Vice-President-elect Mike Pence struck a D.C. police reserve officer according to TV station which reports that police say the officer was conducting traffic control in northwest Washington on Wednesday afternoon when a vehicle in the motorcade hit him. “We’re going to have insurance for everybody,” Trump said. “There was a philosophy in some circles that if you can’t pay for it, you don’t get it. That’s not going to happen with us.” Expect the US to go further into deficit then. Trump has already stated that he would claw back President Obama’s sanctions against Russia regarding Ukraine and Crimea incursions. A women’s march on DC on the day after the inauguration is expected to have 1800 bus loads [those registered] at the time of this blog was sent out. In comparison 400 registered buses for the inauguration. Banned for those sitting close to the stage for inauguration include: umbrellas, guns, fireworks, backpacks, balloons, drums, whistles, and selfie sticks. Few Canadians appear inclined to celebrate this year’s event, if polls are to be believed. A mere 18 per cent told an Angus Reid survey in November that they were somewhat or very pleased with Trump’s win. Canada’s event usually draws a strong turnout given the prime location as the only foreign embassy in the area, near the National Mall and right along the parade route. On Friday, Donald Trump will take the oath of office at the U.S. Capitol to become the 45th president, then pass the embassy and its string of Canadian flags on the way to the White House. 1800 showed up at the last inauguration party. Expect poutine, tourtiere [a meat pie originating from Quebec, usually made with finely diced pork, veal or beef], beef and Canadian beer to be served. The performers list for the inauguration looks a bit pathetic. At this time, the best known is Toby Keith followed by Lee Greenwood. One list didn’t even list Wayne Newton or Paul Anka, which I mentioned before. After that you have 3 Doors Down [one hit wonder in Kryptonite 16+ years ago] and Jackie Evancho from “America’s Got Talent” to sing the national anthem [her career is about to be toast!]. Then it gets worse. The “B Street band” – a tribute band based on Bruce Springsteen’s music was supposed to perform. Add Sam Moore from the duo Sam and Dave. Add some of the Radio City Rockettes. After that you have nobodies. Initially a tribute band called the B Street band were to perform but the band leader saying the decision was based on the respect they have for Bruce Springsteen and the E Street Band. Some believe a backlash was also a reason. Italian opera singer Andrea Bocelli will not be performing at Trump’s inauguration. He’s received death threats if he performs. Trump’s people said he was never invited [save face?]. 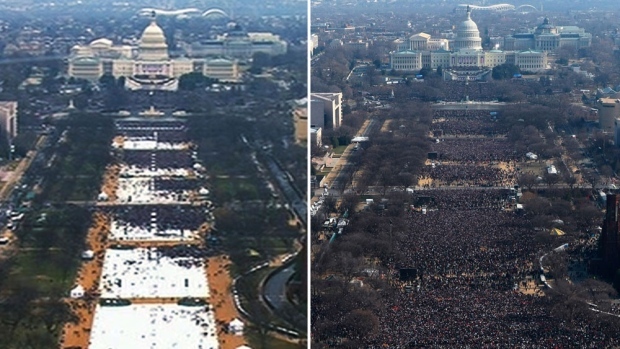 Can’t wait to see what the estimates of the crowd will be compared to previous inaugurations. I’m sure anything less than Obamas’ and Trump while start to whine on Twitter. Unsure who does the official estimates for inaugurations but usually the cops usually give an estimate. He’ll have someone in his team say that it’s at least triple the official estimates. Although he may just say it is 10 times the official estimates and not say where that figure came from [top of his head]. Estimates that the inauguration will cost $200 million US including over $100 million for security. Two days before his swearing in, Donald Trump has forked over $25 million to settle three Trump University fraud lawsuits. The Trump Entrepreneur Initiative, originally known as Trump University, delivered the payment, plaintiffs’ lawyers told CNNMoney. The settlement was reached in November shortly after the election. It kept the president-elect from having to testify in a trial. Students said they were promised access to private financing options that never materialized, and concluded the program was effectively a bait-and-switch. Though initial seminars were free, attendees alleged that teachers only used them to get students to shell out for paid sessions. Trump finally got a tweet right: After civil right icon John Lewis said he hasn’t missed an inauguration in a long time, someone in Trump’s entourage did some research and found out that Lewis wasn’t at George W. Bush’s inauguration in 2001. Trump tweeted it. In an interview he called Lewis’ error “a really big lie”. Exaggeration and Lewis is older than Trump. Already a couple of nicknames have shown up: Commander in Thief, Groper in Chief. Personally, I’ll be watching the 2009 inauguration on YouTube. Classified documents presented recently to President Obama and President-elect Donald Trump included allegations that Russian operatives claim to have compromising personal and financial information about Mr. Trump, multiple US officials with direct knowledge of the briefings have said. The FBI is investigating the credibility and accuracy of these allegations, which are based primarily on information from Russian sources. Trump said prior to the beginning of the confirmation sessions that all his confirmation picks will be confirmed. Uh huh. At his first press conference in months, Trump slammed Buzzfeed News earlier in the press conference for publishing the unsubstantiated documents in their entirety. Trump called Buzzfeed News a “failing pile of garbage” and suggested the website would suffer the consequences of reporting on the material. Trump wouldn’t even take questions from a CNN reporter saying CNN was “terrible,” repeatedly telling him to be quiet and “No, I’m not going to give you a question. You are fake news!” The exchange came the day after CNN and several other news outlets reported that U.S. intelligence officials had briefed Trump and President Barack Obama on unsubstantiated claims that Moscow had compromising financial and personal information [unusual sexual activities] about the president-elect, including scandalous allegations of a sexual nature. Not surprisingly, Trump vehemently refuted the reports calling them “fake news”, a “political witch hunt”, and “tremendous blot” on the record of the intelligence community if material with any such allegations had been released. As well, he says that United States is hacked by other countries as well, including China – brushing it off as if it wasn’t critical. Trump claimed that the documents, which were placed next to him as he spoke, were evidence of the preparations he had made to give over control of his businesses to his sons. He pointed at those documents and claimed they were just part of the various papers required to separate Trump from his business and each pointed at the pile repeatedly as proof that the preparations were being made. Problem is that the sheets were the wrong size [not legal] and blank! See here. President-elect Donald Trump harshly responded to civil rights icon [he walked with Martin Luther King Jr. and was at Selma] and Georgia Rep. John Lewis, calling him “all talk” and “no action” after Lewis said Trump was not a “legitimate” president. “Congressman John Lewis should spend more time on fixing and helping his district, which is in horrible shape and falling apart (not to mention crime infested).” Not surprising, outrage from the civil rights movement. I gather Trump doesn’t know his background. Trump says he’ll be President for 8 years – heaven forbid! He also says there is no US laws that say he can’t run the country and his company. Maybe not, but there are ethics laws. Trump expects “massive” crowds for his inauguration. I suspect when the rough estimates of the crowd comes in from the authorities, Trump will say they are very wrong and will use some way inflated number saying he’s an expert in estimating crowd sizes [like he said he was an expert in hacking]. Trump still is having a hard time finding performers for his inauguration. Supposedly, the biggest name is Las Vegas veteran Wayne Newton – although Canadian Paul Anka may have accepted. While performers have been almost exclusively from the US, Trump has tried to bring in foreign talent [including Celine Dion] and all have so far declined with British singer Charlotte Church calling him a “tyrant” after declining. Why is it that Trump has to bring in non-Americans? President Obama’s first inauguration had maybe a couple of dozen American performers and U2. Classical teenage singer Jackie Evancho had album sales “skykrocketed” [according to Trump] after her December 14 announcement that she’ll sing the national anthem. But some could attribute that to her Christmas albums sell well during the holidays and Evancho appeared on an NBC holiday special December 19. Even then, it wasn’t sales that “skykrocketed”. Another Trump exaggeration. Broadway star Jennifer Holliday decided not to attend the inauguration after the inauguration committee pre-emptively announced her appearance before she decided to perform and because of the outcry from the LGBTQ community. Charles Brotman, the 89-year-old who once the voice of the Washington Senators baseball team, has announced every inauguration parade since Dwight D. Eisenhower in 1957. But not anymore. He was sent his “pink slip” by Email from trump’s transition team. In his place, the Trump team has tapped Steve Ray, a “youngster” as a 58-year-old Washington-based freelance announcer who has worked with the MLB’s Washington Nationals and for local radio stations. Brotman will be honored as “announcer chairman emeritus” – which means nothing. Brotman he thinks it smacks of political payback. From the story mentioned in the previous blog entry, publisher HarperCollins said that it will stop selling a book by Monica Crowley that a CNN investigation found to have more than 50 instances of plagiarism. Trump will transfer his business holdings to a trust, but he won’t sell them — stopping short of what ethics lawyers say is the only sure-fire way to avoid conflicts of interest. All of Trump’s business and financial assets will be placed into the trust before he is inaugurated January 20, according to a lawyer involved in the arrangement. It was not immediately clear who will control the trust. Trump will resign his role at the Trump Organization, his worldwide empire, and transfer control to his two adult sons and an in-house executive, the lawyer said. In the weeks since his election, the Trump Organization terminated all unfinished deals, and Ivanka Trump, who is expected to move to Washington and play a role in his presidency, will relinquish her roles at the Trump Organization, the lawyer said.